Iwasaki Brothers is currently running 116kW (kilowatts) of photovoltaic solar panels to be able to produce a portion of the electricity needed for the business. The solar panels are being installed on three of the company’s metal-roofed buildings, and are due to be in operation by January. 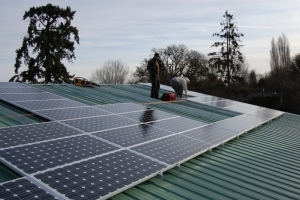 Iwasaki Bros. chose Sunergy Systems to design and install the solar-powered system. The design of the systems allows excess electricity produced by the panels on sunny days to be pushed back on to the public electric grid for others to use. Many of the components were manufactured right here in Oregon. The solar panels used for the system are from SolarWorld, and were manufactured just four miles from our greenhouse. The main power inverter came from PV Powered in Bend, Oregon. Several factors combined to make the decision to purchase and install the solar-powered systems. First, the output efficiency of solar panels has improved significantly in the last several years, making for a more cost-effective system. Second, with the downturn in the economy, panel prices have dropped at least 25%, reducing the overall system costs. Third, there are several state and federal subsidies available right now for renewable energy systems that help reduce the cost of the systems and make the payback period reasonable.